This weekend was one of those magical weekends where the house was clean, laundry was done, and I got in the perfect amount of play time with my family and a little R&R. Lots of bonding time with this little one who is wearing her Tinkerbell sunglasses because it was sunny and in they 70's (but will be sleeting and in the 20's on Tuesday). I took Stella to my new obsession...Yummy Donuts on Lovers Lane. The decor reminds me of I Heart Yogurt, there were a lot of kids for Stella to stare at in amazement, great music playing, and the donuts are so well, yummy! They are so light you feel like you're eating air. 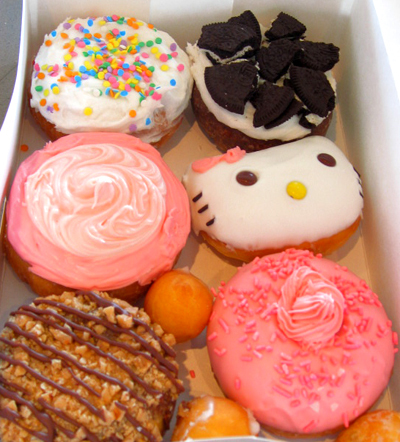 These aren't the ones we got but an assortment of what some of their donuts look like...how cute is the Hello Kitty one? Not all of their donuts look like cupcakes but these are a pretty bunch. A little further down the street at a shop called Lou Lou, these accessory bags caught my eye and then I coincidentally came across them later on The Love List. I think they are so cute. The Packers and the Steelers arrive tomorrow, we have had multiple bomb threats, and we're already noticing the traffic is a lot heavier...the Super Bowl is upon us here in Dallas! It's going to be a crazy week. It was a magical weekend, wasn't it? I now cannot wait for Spring, myself. And, I really didn't need to know about the donut shop...I see it all the time and thus far have resisted. Ugh...supposed to be starting a diet today! how wonderful! a perfect weekend. with perfect food to share with your sweet girl. good for the soul, a weekend like that! I must have that Hello Kitty donut....now! Darn you 10 lb. weight loss diet! I want a donut-cupcake now please. oh I SOOO need to go to Yummy Doughnuts.... oh my! !